On the holes I'm hitting at! 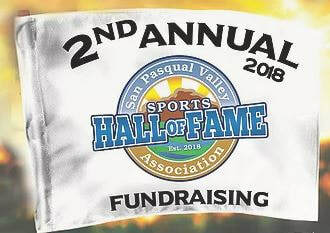 ​SPV Hall of Fame Association is an organization populated with past coaches, teachers, students, athletes, businesses and family who support the creation of a scholarship program and an ongoing Hall of Fame support and development at San Pasqual Valley H.S. SPV Hall of Fame Association is an extension and supporter of the documentary development and a full length feature film about a team and a decade at SPVHS that should never be forgotten. To reward excellence annually through scholarships, and remember historically those who grow through athletics, is the primary focus of the SPVHS Hall of Fame association. Thank you to all who have helped and continue to support. The second annual Tee It Up For Eli charity golf tournament will have a shotgun start at 9 a.m. Saturday, Jan. 19, at the Arizona City Golf Course, 13939 S. Cleator Road. Donation is $50 per person or $180 per foursome. World Record Champ Lynn “Captain Crush” Ray will be there, a raffle will be held and a lunch buffet will be available. To register, contact Steve Ketsdever at 520-858-5678 or Kyle Wright at 520-560-3180. Eli has a rare genetic disease called Fanconi Anemia, which will lead to cancer, leukemia or both. There is no cure, and the family travels to Cincinnati Children’s Hospital multiple times a year for evaluation and testing. Proceeds go to helping the family travel and pay for medical care as well as research for Fanconi Anemia. For more information on Fanconi Anemia, go to www.fanconi.org. 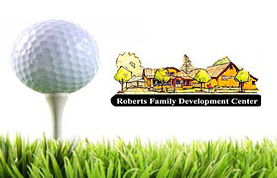 The mission of the Roberts Family Development Center is to provide services in the Greater Sacramento Community that meet the individual needs of each family member. Services provide a holistic approach focusing on early childhood and family education, economic empowerment, and technology. Their goal is to nurture personal growth, strengthen families, and enhance community development and civic involvement. November 7th, 2018 for their 19th annual tournament and help raise money and awareness for a disease that affects so many women and men around the world. PLAY GOLF & MEET CHRISTIAN OKOYE Former KANSAS CITY CHIEF, FULL BACK. ​The Berkeley Alumni Chapter of Kappa Alpha Psi Community Project, Inc. 501(c)(3), will host its 10th Annual Charity Golf Tournament at The Metropolitan Golf Links in Oakland, CA on Saturday, October 21, 2017. Proceeds for this event benefit our Community Service and Scholarship programs for students in the Oakland/San Francisco Area. The tournament is a 4 person best ball scramble. The price per golfer includes green fee, cart fee, range balls, on-course contests, and banquet luncheon. Raffle tickets and opportunities to bid in a silent auction will be available throughout the day. In addition to recognizing the Tournament's top finishers, there will be contests for the Longest Drive and Closest to the Pin. In the Berkeley Alumni Chapter, chartered in 1947, chapter members have regularly mentored students and participated in community service projects. 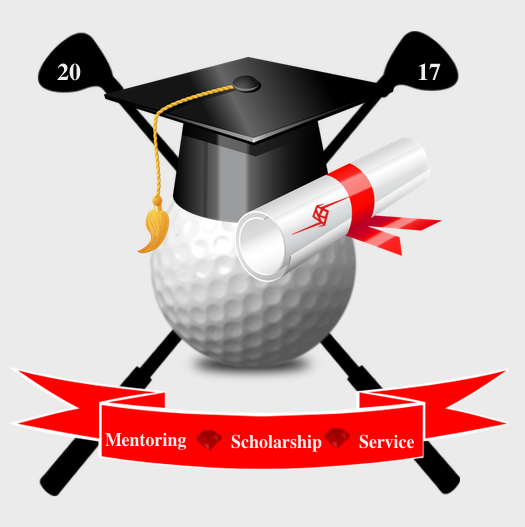 Since its founding, the Kappa Alpha Psi Community Project, Inc. 501(c)(3) has hosted a Charity Golf Tournament to help fund it's community service activities and scholarships to assist local qualified students in pursuing post secondary and graduate degrees. 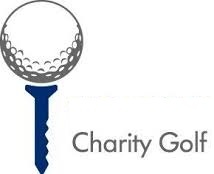 Attendees and sponsors of the Charity Golf Tournament have generously helped the Kappa Community Project, Inc. continue to provide community service and scholarships. ​Golf Fest is one of the longest running consumer outdoor golf shows in the nation. The two-day event offers golfers of all ages and skill range an opportunity to test out the latest club technology on the market; meet reps directly to find the best products to improve their game; get free hands-on training from PGA pros; witness Lynn Ray’s amazing golf trick shot show; enjoy a brew and brat in the Las Vegas Golf Center food pavilion; sample some of the top craft beers around; win big prizes in the putting challenge; enjoy free golf clinics; and much, much more. Get a certificate good for a round of golf at Primm, Aliante, Legacy, Wildhorse or Mt Falls as part of your paid admission. Offer is valid for one round of golf ($25 cart fee not included). Tee times can only be booked two days in advance. Certificate will not be honored for tee times booked more than two days in advance. Tee times must be booked via phone and are valid Monday through Thursday anytime and Friday through Sunday after 11:00am. Must surrender certificate upon redemption. Offer expires 12/31/18. Sample some of the very best craft beer in Vegas, including Tenaya Creek, Garage Brewing, Magic Hat, Sam Adam’s, Hop Valley, Wasatch and Kona! 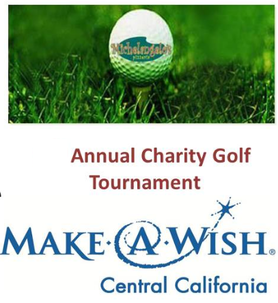 ​This year will be our 7th Annual golf tournament benefiting Make-A-Wish of Central California. Calling all golfers interested in playing please come in and get a team together. The last day to turn in registration forms is September 1st. If you haven't played in our tournament it's a great time: golf, live music, food, and all for a great cause. If your not a golfer contact us about donations or sponsorships. All dinner tickets must be purchased before the event, you cannot purchase at the door on the day of the event. Thank you all for your support. ​please call Omar or Diego at (559) 322-1666. Fee Includes Golf, Range Balls, Cart, Hole Contests, Keg Beer, Lunch. Available Sponsorship Opportunity Levels range from $200-$3500! Pin Flag Sponsor $2500: Market yourself on all 18 holes with your exclusive pin flag sponsorship. Sponsorship includes a foursome, and your logo on the tournament banner. Animal Lover Sponsor $825: 1 golf foursome, 2 tee box signs (18x24), option to market in goody bag or on course, and your logo featured on the tournament banner. Tee Box Sponsor $200: One 18x24 Tee Box sign- advertise anything you want! Even a picture of you and your pet! Beverage Cart Sponsor $1000- Have your banner on the beverage cart and your logo on drink tickets that will be given out to all the golfers. You also have the option to market in the goody bag. 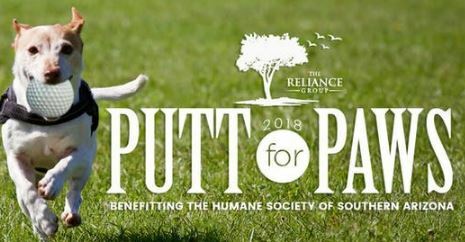 Putt For Paws 2018 official Tournament shirt sponsor $1000: Your logo will be prominent on all of the tournament t-shirts, your business included in social media posts, logo included on the flyer that goes into the goody bag, and on the banner at the event. Also option to add swag to the golf bags. 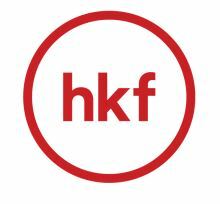 The Mission of the Heidi Krueger Foundation for Giving is to support Financially challenged students in creating a future for themselves and their families, by helping them complete their education. The Foundation achieves this by awarding educational grants to deserving students. Transcendent Planning presents the Inaugural “Wear White, Play Golf & Support Cancer Research” Event. Join us on Saturday, June 23rd at Oak Creek Golf Club to raise money for Cancer Research. The event is in honor of Eric's mother who passed away from cancer in 2014 and Gavin's father who is currently battling prostate cancer and every other person affected by Cancer! *Opportunity to win additional FREE clubs on course, memberships to Oak Creek, rounds to Oak Creek and Pelican Hill, Titleist ProV1 Golf Balls, night stay at Ayres Hotel, Cash $$$ and much much more. Golfers will also have the opportunity to support Cancer Research by purchasing and participating in Mulligans, 50/50 Raffle Tickets, Raffle Items, On-Course (Putting, Closest-to Pin and Long Drive) contests as well as Individual and Team Awards and Prizes. There will also be additional opportunities to win FREE clubs and prizes throughout round! Bloody Mary's and other beverages (leaded and non-leaded) will be available throughout the event. Proceeds from the event will benefit the Cancer Research Institute (CRI), a nonprofit dedicated to funding breakthrough science for a future immune to cancer. We are proud to collaborate with this amazing organization, where 86 cents of every dollar contributed goes towards programs focused on cancer immunotherapy research. We are asking all golfers to Wear as much White as possible to support Cancer Research! Direct donations are welcome and appreciated and can be done through "Ticket" tab. Help Our Scouts Reach New Peaks! By supporting the Boy Scouts and Troop 709, you are supporting America’s future. 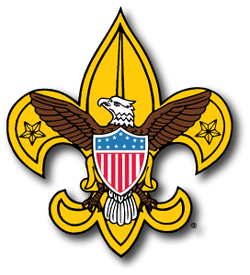 For over a century, the Boy Scouts of America has helped build the future leaders of this country by combining educational activities and lifelong values with fun. The Boy Scouts of America believes and, through over a century of experience, knows that helping youth is a key to building a more conscientious, responsible, and productive society. Please join us on Saturday, June 16, 2018 at the St Mark Golf Club and show your support for Troop 709 and the Boy Scouts of America.Fundraising proceeds used to support the Scouts summer program activities including Philmont Scout Ranch in 2019 and Glacier National Park in 2020. $75 per person on a 4 person team! 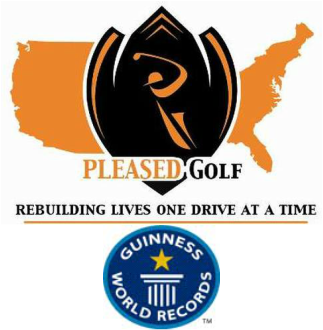 JOIN THE LONGEST DRIVE PRO! Lynn Ray will be at our June 2nd tournament to help make this event so much fun! Lynn assists charities with their fundraising by coming and showing his stuff! and help to our fundraising! Lynn holds the record for longest drive! They don’t call him “Capt’n Crush” for nothing! At a designated hole, “Capt’n Crush” will welcome the groups and will hit some drives from 350 to 400 yards. The team can use his longest drive for that hole. He will also hit a couple of trick shots, offering some fun and entertainment. 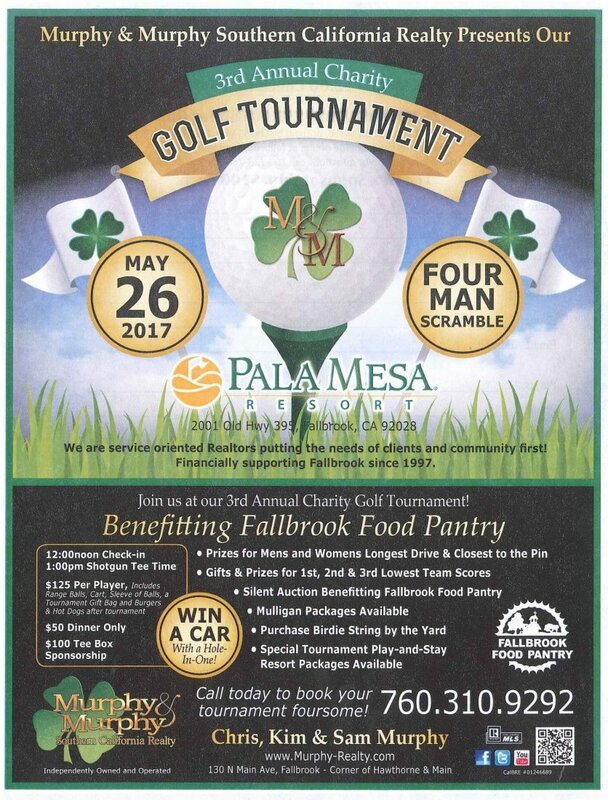 FALLBROOK – Weichert, Realtors Murphy & Murphy present their Charity Golf Tournament to benefit the Fallbrook Food Pantry on Friday, May 25. The event will include 18 holes of golf (with cart, range balls, sleeve of balls, tournament gift bag, and burgers and hot dogs after the tournament) and an awards dinner at Pala Mesa Resort, 2001 Old Hwy 395, Fallbrook. The event also includes ‘Win a Car’ with a hole-in-one, prizes for men’s and women’s longest drive and closest to the pin; gifts and prizes for first, second, and third lowest team scores; Mulligan packages; and Purchase Birdie String by the Yard. An exciting silent auction will be available during the awards dinner. 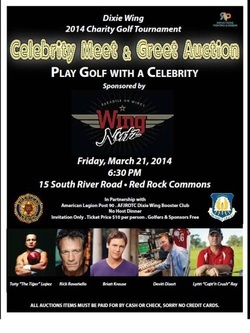 The cost is $125 per player or $500 per foursome; dinner is only $25 per person; tee box sponsorship is 100. Registration starts at noon with a shotgun start at 1 p.m.
throughout his 50 year career. 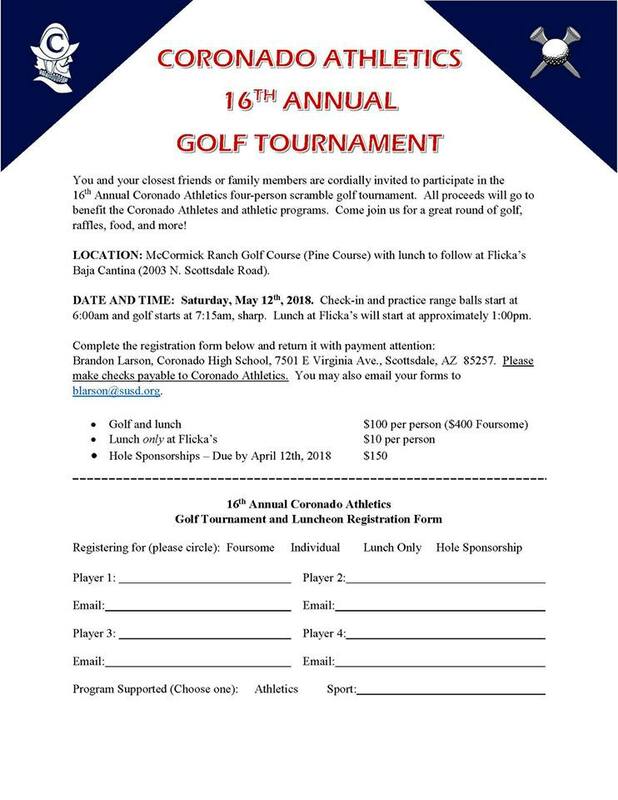 Coronado Athletics is holding their 16th annual Golf Tournament on Saturday, May 12th. If you would like to participate in the Tournament or sponsor a hole, please follow the instructions on the flyer below. Please share this flyer with friends and family so we can make this the best Golf Tournament to date!!! 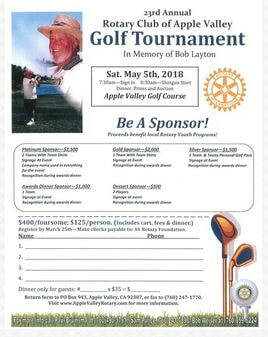 23rd Annual Rotary Club of Apple Valley Golf Tournament & Luncheon in loving memory of Bob Layton. Fantastic prizes, silent auction luncheon & awards. Including a chance to win a 2018 GMC Terrain from Greiner for a Hole-In-One! 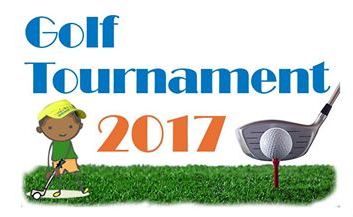 Sign in will Start at 7:30 A.M. and Shotgun Start at 8:30 A.M.
​Register by March 25th- Make checks payable to AV Rotary Foundation. Return forms to PO Box 943, Apple Valley, CA 92307, or fax to (760)247-1770. 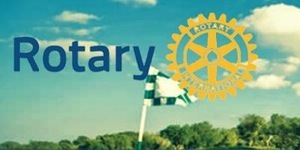 ​Visit www.AppleValleyRotary.com for more information. Our 1st golf tournament was a sucess and we are looking forward to another year full of fun, laughter, and new relationships. 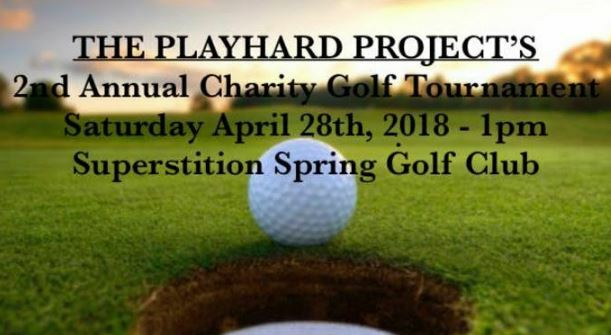 The Playhard Project will be holding their 2nd Annual Charity Golf Tournament Saturday April 28, 2018 at Superstition Golf Club, scramble to start at 1pm, registaration will begin at noon. Want more information on The Playhard Project, visit www.theplayhardproject.org. Thank you for your help impacting a childs life In a positive way, we would not be able to do what we do without you! Stanislaus County PAL, a non-profit for the benefit of the children of Stanislaus County will be hosting its 16th Annual Charity Golf Classic on Saturday April 21, 2018 on the Ranch Course at Diablo Grande. Registration, Brunch and Pre-Tournament Contests begin at 8:30am with a Shot-Gun start at 10:00am. **Golf Digest** "TOP 100 GREATEST PUBLIC COURSES IN THE U.S."
This charity tournament will raise funds that go directly into Scholarships, Field Trips, Special Events, After School Programs, Job Development, Youth Sports Leagues, Tutoring and much more for children between 6 and 18 years of age in Stanislaus County. Tournament fee will include: Golf, Cart, Range Balls, Golf Shirt, Brunch, Dinner, On Course Refreshments, Awards, Silent Auction, Raffle, Wine Tasting on Course, 2 Longest Drive Contests, Straightest Drive Contest, 4 Hole-In-One Contests, 3 Closest-to-the-Hole Contests and much more. or bsilveira@stancopal.org for registration and information. The Phoenix Squaw Peak Rotary Club is one of the zaniest around, but we do have our serious side. We are committed to helping to improve our community, including the support of deserving charitable organizations. Your contributions give us valuable assistance in that effort. We thank you. While we hope you have fun at the tournament, you should also be proud of your participation in support of charity. 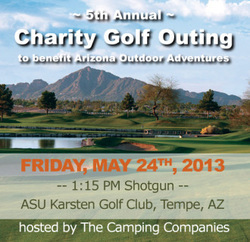 Don’t miss signing up for one of the Valley’s greatest charity golf tournaments! Your contribution provides vital support for charities in need. This year’s format is a Four-Person Scramble and we have many fine prizes to award. There will be a longest drive, closest to the pin, and other prize holes. Enter today! ​The eighth annual charity golf tournament in support of the City of Goodyear Police Department K9 Unit is just over a month away. The Pet Companion’s Club is hosting this event taking place Saturday, February 17, 2018, on the Tuscany Falls/Palms Course (1:00 p.m. shot-gun). Cost of this event is $85/player ($50/player for homeowners with a PebbleCreek Golf Players Card). Team sign-up forms and additional details are available at both pro-shops. You can also download the form from the homepage of the Pet Companions Club website: pcpets.org. If you would like to help sponsor this event, please contact Jeanne Place at 623-935-4413. For those who are unable to play, please come out and meet our Goodyear K9 Officers and their canine partners. A live K9 demonstration will take place beginning at noon near the Tuscany patio. We will also be selling GYPD-K9 tee shirts on the patio to help raise extra money this year, so don’t forget to stop by and show your support. Any questions regarding this tournament can be directed to Chrissy Bridges at 623-935-9710. The second annual Tee It Up For Eli charity golf tournament will have a shotgun start at 9 a.m. Saturday, Jan. 27, at the Arizona City Golf Course, 13939 S. Cleator Road. Donation is $50 per person or $180 per foursome. World Record Champ Lynn “Captain Crush” Ray will be there, a raffle will be held and a lunch buffet will be available. To register, contact Steve Ketsdever at 520-858-5678 or Kyle Wright at 520-560-3180. The inaugural tournament will kick off with a hot air balloon ascension at 7 am on the 18th green. Golfers will then have a shotgun start for a full round of golf. Celebrities will drop back, allowing every golfer a chance to play three holes with the celebrities. This event is hosted by Kenny Johnson. He’s currently starring in CBS’s S.W.A.T.. He’s also starred in Sons of Anarchy, Bates Motel on A&E and The Shield. This will be the most fun round of golf in the desert. There will be something cool at every hole. You can expect prizes, beer tasting, hula dancing, music and so much more. Funds raised from this event will be used to sponsor more Kai Wai kids and for buying key gear needed to take them paddling on the water; canoes, personal flotation devices, aqua shoes and sunscreen. Enjoy a day at St. Mark Golf Club for our four-person scramble tournament, with opportunities to participate in contests throughout the day, enjoy on-course food and beverages, and raffle prizes, ending the day with an awards banquet and silent auction. 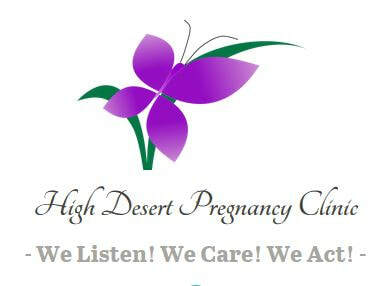 Click the button below to view sponsorship opportunities or contact Danyelle Hoshauer at (760) 471-2490 ext. 302 or danyelle@boysgirlsclubsm.org for more information. NFTE Los Angeles is partnering with PEALA to host the 7th Annual Charity Golf Classic! Purchase your individual registrant tickets to join us for a day of golf supporting our young entrepreneurs! 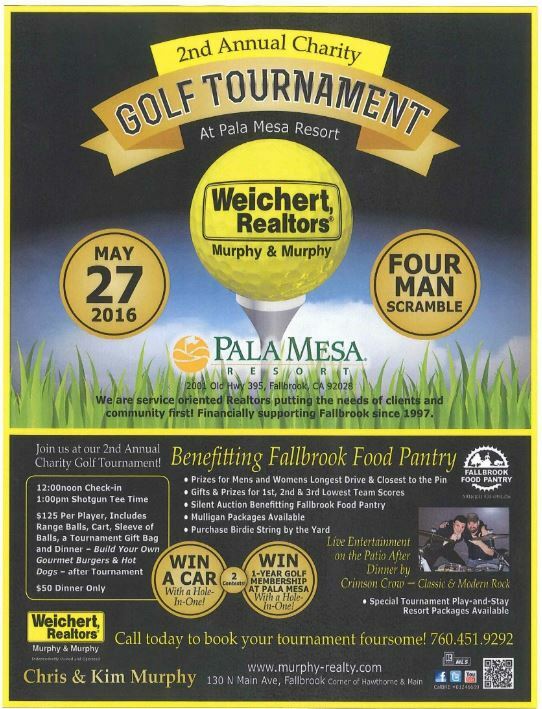 FALLBROOK – Weichert, Realtors Murphy & Murphy present their inaugural Charity Golf Tournament to benefit the Fallbrook Food Pantry on Friday, May 27. Join us on May 20th for our inaugural golf tournament for The Playhard Project! The Playhard Project provides young athletes scholarships to participate in both mainstream sports as well as school sports programs. We are looking for players, sponsors, donations, and volunteers. Please contact me for more information at joann@aproposcreations.com or visit our website at www.playhardproject.org to sign up or for more information. Over the last three years, Byrds Fore A Cure has raised over $30,000 for the Arizona Chapter of Cure SMA, thanks to the support of our golfers and community partners! 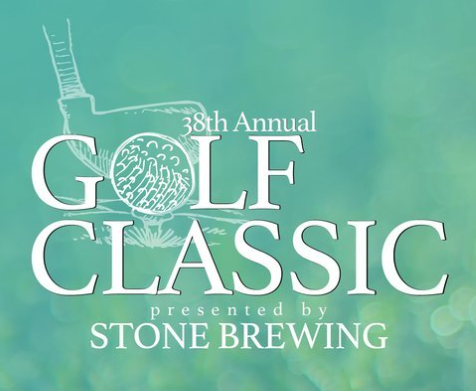 This year, on Saturday, May 6th, at Stonecreek Golf Club in Phoenix, 75+ golfers and our business sponsors will come together again for another exciting event! The Duke Golf Club at Rancho El Dorado, in Maricopa, registration and breakfast begin at 6:00 am on April 30th!Come and enjoy a great day of golf at the The Duke Golf Club at Rancho El Dorado. There will be many opportunities to win fantastic raffle prizes, silent auction items, and of course the golf awards. All Net proceeds go to benefit the valuable programs provided by the Grand Canyon Council and the Boy Scouts of America. Saturday April 22nd, 2017 *To Benefit ROLLING THUNDER*The men and women of CWC are hosting their 5th annual golf tournament to benefit Rolling Thunder! And we need you, your family, and your friends to come have fun while raising money for a GREAT CAUSE! Snacks will be provided to you on the course as well as a fun swag bag at registration! A food banquet, silent auction, and awards ceremony to follow the tournament. Once again we having the Longest Drive Contest , Straightest Drive, Putting Contest, Closest to the Pin as well as a Hole In One - if you have purchased the Games Package ! The best surprise...a hole in one vehicle provided by Rusnak BMW is also up for grabs to win! We will announce the hole! We almost had a winner last year! It was a phenominal shot...will you be the one to win a beautiful brand new vehicle? So please don't delay and register yourself , a friend or with your foursome today! Help us with this amazing cause and give back to those who have kept our country strong and free! 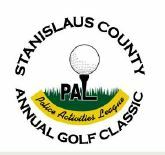 Stanislaus County PAL, a non-profit for the benefit of the children of Stanislaus County will be hosting its 16th Annual Charity Golf Classic on Saturday April 16, 2016 on the Ranch Course at Diablo Grande. Registration, Brunch and Pre-Tournament Contests begin at 8:30am with a Shot-Gun start at 10:00am. Three year old Eli was recently diagnosed wth Fanconl Anemia, a rare genetic blood disease. November 5th, 2016 for their 17th annual tournament and help raise money and awareness for a disease that affects so many women and men around the world. 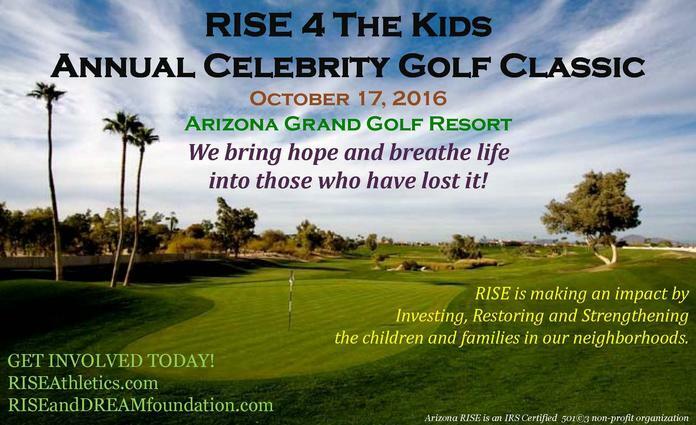 We are excited to host our RISE 4 The Kids Celebrity Golf Tournament at the Arizona Grand Resort on October 17th. Each foursome will be matched with a celebrity for the day to golf with and have a fun time out there on the beautiful course. Golfers are provided breakfast, lunch and a custom welcome gift for attending. There is an awesome silent auction and over 50+ raffle items to be given away. 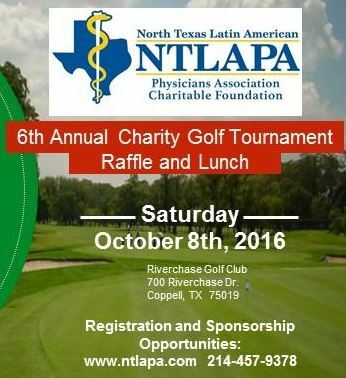 Please join us for NTLAPA/NTLAPA Charitable Foundation's (NCF) 6th Annual Charity Golf Tournament, Raffle and Lunch on October 8, 2016. Lunch and registration at 12 noon. Shotgun start at 1:30pm. We will have a great day of golf at the beautiful Riverchase Golf Club in Coppell, TX. The event will include a 4-person scramble, box lunch and awards receptions following the golf. 100% of our proceeds will go to our scholarship and community support programs. NCF is a 501c3 non profit organization. Special Offer: Included with your online registration is a 1-year subscription to Golf Digest. Click here for offer and refund details. Thank you for your support of NTLAPA and the NTLAPA Charitable Foundation (NCF). Oklahoma vs Texas College Football game! 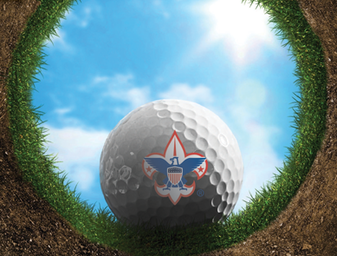 ​golfing with us to support the youth on Friday & then enjoying the Red River Rivalry the next day! Join us by playing in the tournament! Foursome are just $500! 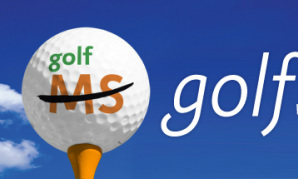 Enjoy a great fundraiser while golfing at Michelangelo’s 5th Annual Charity Golf Tournament! 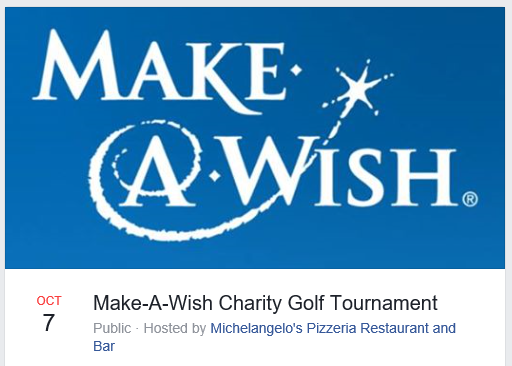 All proceeds help Make-A-Wish Central California grant multiple wishes for local children with life threatening illnesses. Help us give these kids and their families a little bit of normal in their lives by helping us grant their wish. 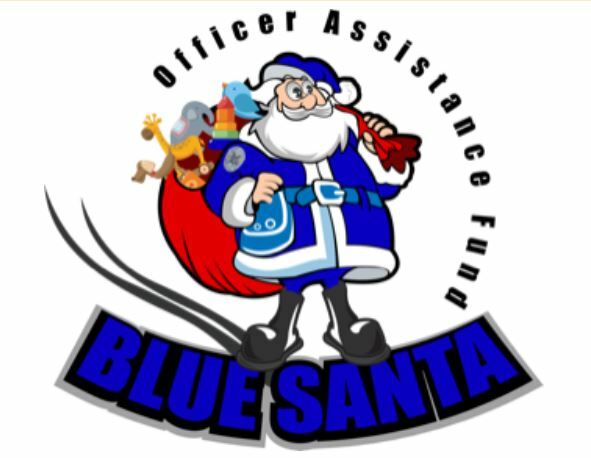 The golf tournament will be held at the Riverside Golf Course at 6492 N. Bryan Ave., Fresno, CA 93722 with a dinner to follow. Dinner will be held at Michelangelo’s Pizzeria at 619 Woodworth Ave., Clovis, CA 93612. We will also have a prize for the best dressed golfer…so be sure to dust off your knickers & argyle socks/sweaters! please call Omar or Diego at (559) 322-1666. 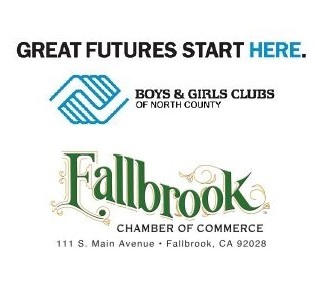 Fallbrook Chamber of Commerce and Boys and Girls Club! 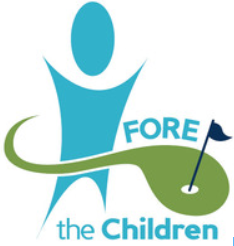 The Fore Kids charity golf scramble is a golf tournament like no other. It’s an incredible experience with loads of prizes and even more fun – all in support of educators and the students they serve. 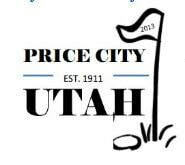 This year’s event will take place on Thursday, July 28, 2016 at Wasatch State Park Golf Course (lake and mountain courses) in picturesque Midway, Utah. 975 W. Golf Course Dr.
Progress Ranch Treatment Services is a local non-profit serving 6 foster youth. Our mission is to provide a safe nurturing environment to support the boys moving back to a family home. Community activities and sports are a great way for our youth to experience a positive, pro-social experience. Saturday, July 9th 12:00 p.m.
Get your foursome in now for our 7th annual charity golf tournament benefitting the City of Beaumont Memorial Park. 9am scramble format. $125 per person. 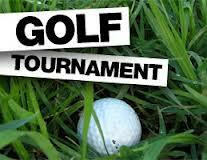 Registration fee includes golf, event shirt and lunch @ SandTrap immediately following the tournament. Entry forms available at the SandTrap. 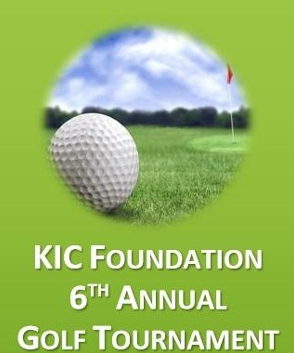 Join us for our 6th Annual Charity Golf Classic on Saturday, June 18, 2016! 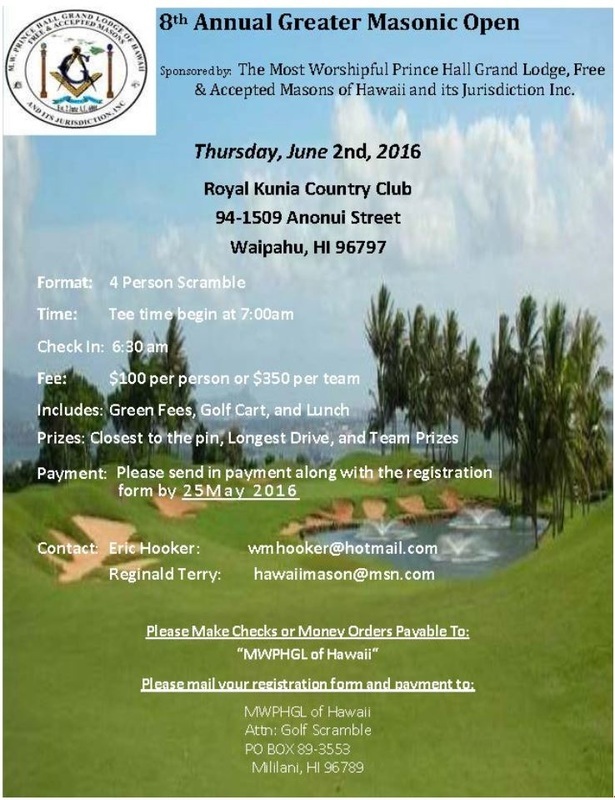 will be held on June 2, 2016 at the Royal Kunia Golf Course located at 94-1509 Anonui Street, Waipahu, Hawaii 96797. Prizes will be awarded to the top finishers, closest to the pin and longest drive. Additional information will be provided as we draw nearer to the event. The Greater Masonic Open will be followed by a complementary luncheon. Awards will be given at the Awards Banquet which will be held on June 4, 2016 at the Doubletree by Hilton, Alana Waikiki Hotel, 1956 Ala Moana Blvd., Honolulu, Hawaii 96815. Attendees will enjoy a memorable evening honoring those who have given tirelessly of themselves to enrich the lives of citizens at the local and state level. Additional information is contained in the attached brochure. Frasher's Annual Charity Golf Tournament is back this Memorial Day! 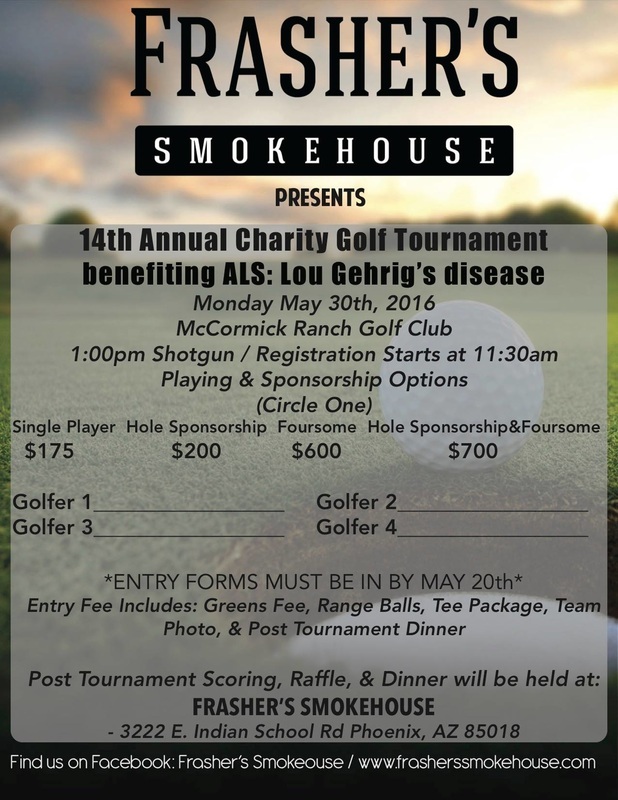 Monday, May 30th we will be teeing off at McCormick Ranch Golf Club with the award ceremony and dinner following at Frasher's Smokehouse! Stop on in or give us a call at (602) 314-5599 for more information! Fourth Annual AFJROTC Dixie Wing UT 20061 Golf Tournament. 2366 West Sunbrook Drive, St. George, UT. Please contact Linda Elwell at (435) 673-1718 for entry forms or view them in our photo album on this page. 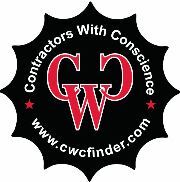 The fourth annual charity golf tournament hosted by Contractors With Conscience (CWC) will be held on April 23, 2016 in Thousand Oaks at Los Robles Golf Course beginning at 7am for registration and 8am for play. Included in the cost of $125 per player is lunch afterwards, the awards presentations, and silent auction. You could even win a vehicle from Kemp Ford for a hole in one! This year CWC has selected two local, community based groups associated with the military and veterans to benefit from the tournament. First is Rolling Thunder which helps veterans in any manner needed but still is active in bringing the bodies of POWs and MIAs home. Dusty Trails assigns herding dogs to veterans with PTSD and helps them find peace again. They also provide housing for dogs when their caretakers are deployed so that no military person has to give up their dog. Don’t play golf? 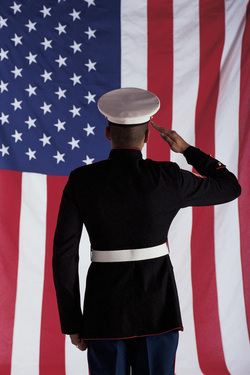 Sponsor a veteran or service member. Go to cwcfinder.com to sign up. We are also looking for silent auction and raffle prizes. Contact Diana Slater at (805) 428-7308 or info@MakingBeautifulSpaces.net to donate or to purchase advertising at the holes. P.S. I don’t play golf as you might be able to tell. 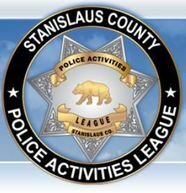 Stanislaus County PAL, a non-profit for the benefit of the children of Stanislaus County will be hosting its 15th Annual Charity Golf Classic on Saturday April 16, 2016 on the Ranch Course at Diablo Grande. Registration, Brunch and Pre-Tournament Contests begin at 8:30am with a Shot-Gun start at 10:00am. There will be a bag drop area in front and we will have a dedicated beverage cart for our group. The Canyon Lake Golf Course announced plans this week for the 3rd annual Veterans Day Golf Tournament to raise funds to assist service members who have been injured in the line of duty. All funds raised from the tournament will be donated to the nonprofit organization, Wounded Warrior Project (WWP), and will support a full range of programs and services for this generation of injured veterans and their families. Last years event raised close to $3,000 for the Wounded Warrior Project. This year the tournament will be held Monday, November 10, the day before Veterans Day, and will be a four-person scramble. The cost is $50, which includes green fee, cart fee and range balls. The tourney is $30 for Canyon Lake annual members. Active duty military personnel play free-of-charge. What's better than a fun-filled round of golf at the beautiful Golf Club of Texas? Doing it for a great cause. 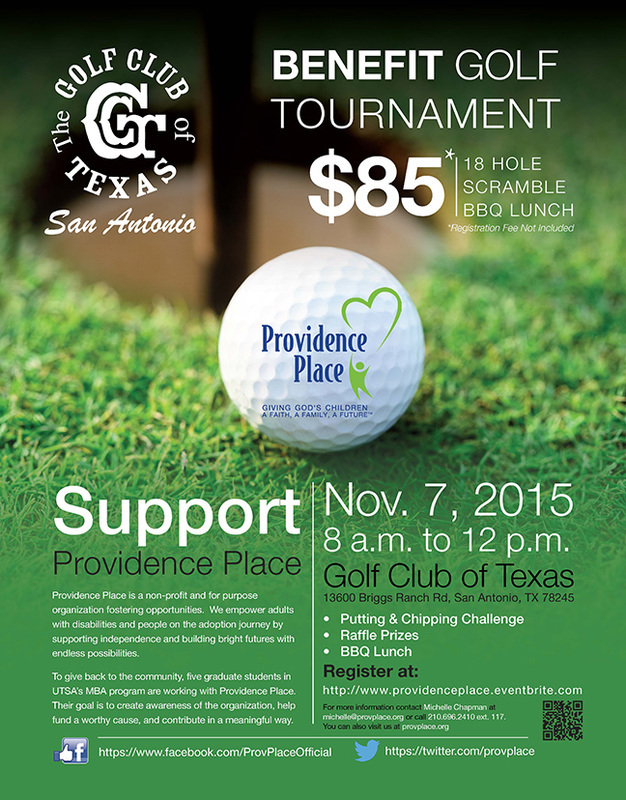 Join us as we tee-off for Providence Place, a great organization with unparalleled commitment to the community of in San Antonio. Providence Place is non-profit and for-purpose organization fostering opportunities by enabling independence and building bright futures with endless possibilities. They have two services: their Action Adoption program and their Center for Higher Independence, which is a transitional school for young adults with cognitive and physical disabilities. For more information about how Providence Place lives out their mission, visit www.provplace.org. November 4th, 2015 for their 16th annual tournament and help raise money and awareness for a disease that affects so many women and men around the world. Enjoy some fun in the sun on the links! 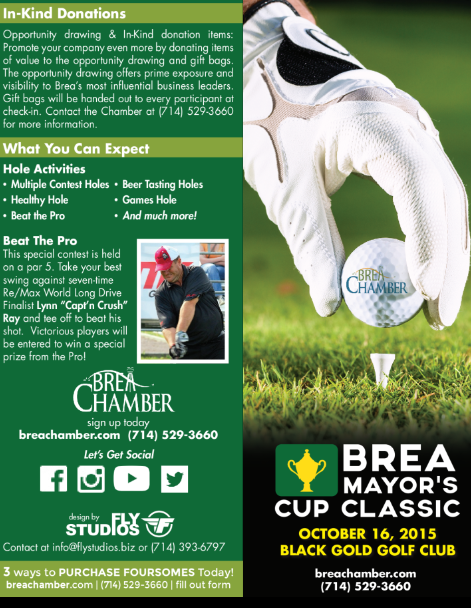 Join the Brea Chamber for the Mayor's Cup Annual Golf Classic on Friday, October 16th. The event offers your organization the opportunity to cater to clients with a day out on the green; allows your staff the chance to relax and unwind; and provides ample time for networking with a diverse array of power players in the area. A traditional sell out with 144 golfers, our tournament participants represent a wide range of industries. In addition to offering an exceptional marketing and public relations opportunity for your business, your sponsorship is invaluable in expanding our efforts to forge a strong an diverse business climate to benefit every company in the Brea business community. 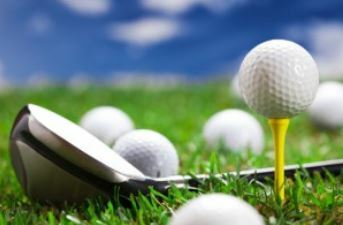 Participation in the golf tournament will directly benefit local education efforts, as a portion of the proceeds gained will go to the Brea Olinda High School Golf Team. Developing business ethics and enhancing student programs tie into the Brea Chamber's workforce development mission, as the Brea Chamber strongly believes in creating a large educated workforce that can help benefit the local business community for decades to come. We will also have a prize for the best dressed golfer…so be sure to dust off your knickers & argyle socks/sweaters! Air For Paws is an all-volunteer, nonprofit organization established in 2009, which equips first responders with animal resuscitation kits and training for the resuscitation of pets. Each kit contains specially designed oxygen masks constructed to properly fit animals ranging in size from pocket-pets to large dogs, with instruction cards and any necessary adaptive/supporting equipment. More than 600 kits have been placed throughout 17 states and in worldwide military bases, at no cost to the first responders. Originating with the fire and rescue agencies in Morgan Hill, Air For Paws is now recognized from coast to coast. This year, in cooperation with Old Dawgs & Pups, Air For Paws lifesaving first response equipment has been deployed to U.S. military working dogs in locations in Southwest Asia and Europe. The Ledges Golf Course, St. George. 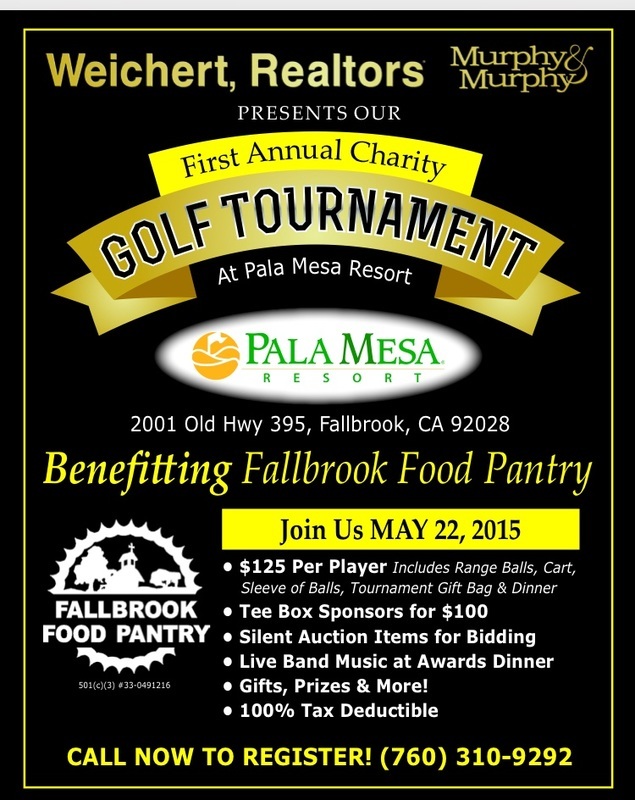 FALLBROOK – Weichert, Realtors Murphy & Murphy present their inaugural Charity Golf Tournament to benefit the Fallbrook Food Pantry on Friday, May 22. 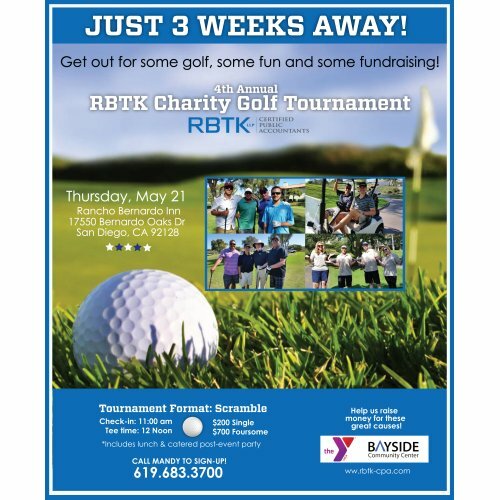 RBTK Charity Golf TournamentOn Thursday, May 21, local CPA firm RBTK will host its 4th Annual Charity Golf Tournament to benefit The Rancho Family YMCA and Bayside Community Center. 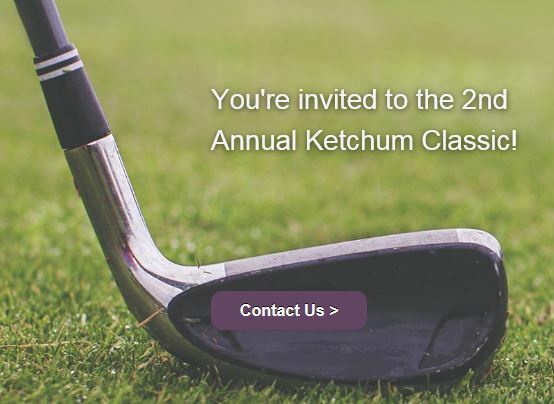 Join RBTK for an exciting day of golf, contests, awards, and a special silent auction all while supporting a great cause. The tournament will be held at the beautiful Rancho Bernardo Inn’s newly renovated 18-hole California Championship Golf Course. The spectacular course, which has hosted both PGA and LPGA events, is enjoyable for golfers of all levels. Check-in starts at 11 a.m. followed by tee time at noon, and a post-event award party at 5 p.m. Guests are invited to play singles for $200 or foursomes for $700. The cost includes golf, lunch, a catered post-event award party, and a silent auction with awesome prizes. Guests are also invited to participate in the hole-in-one, long drive, and putting competitions. The Rancho Family YMCA is a community-centered non-profit organization that promotes youth development, healthy living, and social responsibility. The Y fosters a safe environment for people of all ages and backgrounds to encourage social change and growth. The Bayside Community Center, located in Linda Vista, serves over 300 low-income community members each day, providing food and financial assistance as well as educational and health care programs. The Rancho Bernardo Inn is located at 17550 Bernardo Oaks Drive, San Diego, CA 92128. 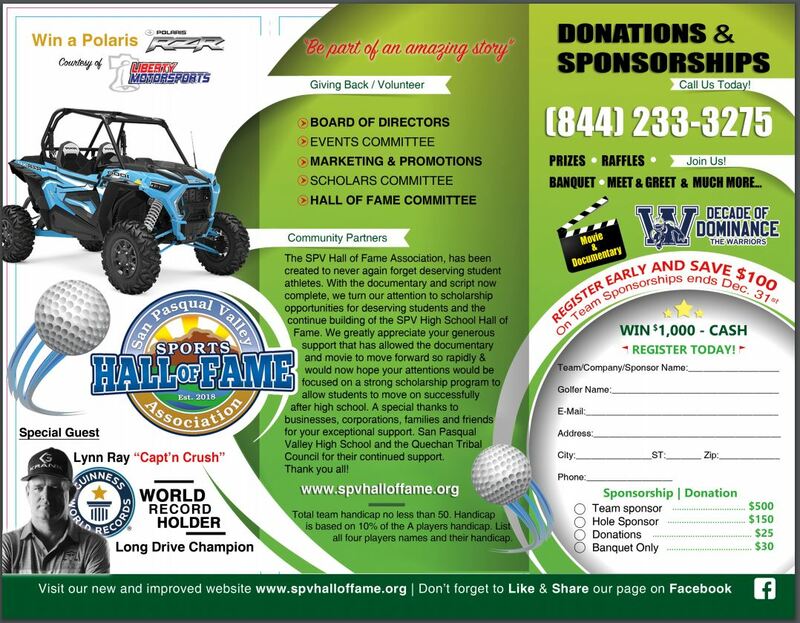 For anyone interested in participating as a golfer, sponsor or prize donor, please contact Mandy Podlesny at (610) 413-4991 or Mandy@spearhall.com. Please join Aerotek for our 3rd Annual Charity Golf Event with proceeds benefiting the Dr. C. C. and Mabel L. Criss Heart Center at Children's Hospital & Medical Center. Come help us support this great cause and enjoy a day of golfing! All golfers receive goodie bags with gifts from our sponsors. There will be prizes for closest to the pin and longest drive, along with raffle prizes and giveaways during dinner. Questions? Please contact Ryan Gillis at rgillis@aerotek.com or 402.997.7629. TIP is a group of specially trained volunteers who work with police, firefighters and nurses to provide emotional aid and practical support to victims of traumatic events and their families in the first few hours following a tragedy. We ask for them to be on call during three-twelve hour shifts a month to make a change in our neighbor’s life and yours. $100.00 Entry Fee includes: Golf, Cart, Range Balls, entry for Putting Contest and BBQ lunch W Band! About our Charities: The annual Skeeter McFee tournament benefits the many worthy charities the Phoenix Squaw Peak Rotary Club proudly supports. Yourcontributions have provided much needed assistance to victims of domestic abuse, children suffering from neurological disorders and persons in need of affordable housing, among other worthwhile charities. We thank you for your continued support. 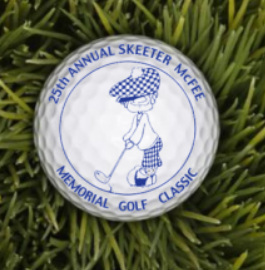 The Skeeter McFee Golf Tournament has become a valley tradition: Don’t miss signing up for one of the Valley’s greatest charity golf tournaments! Your contribution provides vital support for charities in need. This year’s format is a Four-Person Scramble and we have many fine prizes to award. There will be a longest drive, closest to the pin, and other prize holes. Enter today! Support AZ L.A.S.T. !Attention all golfers at all skill levels, the 13th annual Steve Alley Memorial charity golf tournament is just around the corner. 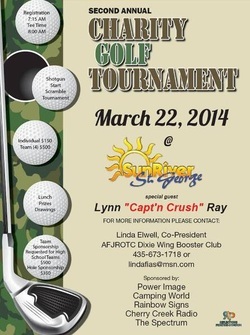 We’ll be playing at the Luke AFB “Falcon Dunes” golf course on Friday, March 27th, at 8:30am (7:30 early registration). The tournament was held there last year and the course was in awesome shape, and will be again this year. This is a military golf course and generally closed to the public so playing here is definitely a don’t-miss opportunity. There will be lots of nice prizes and giveaways, including free breakfast and lunch. Get your team registered soon as registration ends March 16th. Organizers said the tournament is held to raise funds for the Kids in Conflict Foundation. KIC provides services for at-risk children in the Coachella Valley and throughout Riverside County who are currently in Juvenile Hall or placement. The Classic Club, located at 75200 Classic Club Blvd., is a nationally recognized championship course designed by Arnold Palmer. 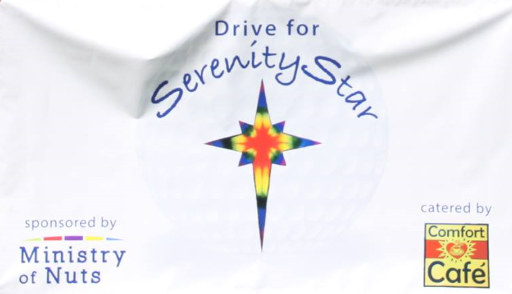 The entry fee for the charity golf tournament is $500 per foursome or $125 per single golfer. The entrance fee includes: golf, golf cart, breakfast bar, tee bags, luncheon, prizes and a player shirt. If you don't want to golf, you can just go to the luncheon for $30. Check in time begins at 6 a.m. and the shotgun scramble is at 8 a.m. When you hear the name Frank “The Tank,” you may recall Will Ferrell’s streaking fraternity boy in the comedy “Old School,” but Frank “The Tank” Boschma is an actual real life hero. Boschma, pictured above, suffers from X-linked SMA, Arthrogryposis or SMA type 2 and, in March of last year, community leaders came together and held a charity golf tournament in an effort to purchase him a new TRACK mobility chair. A year later, Boschma is helping to plan his namesake tournament to give another hero the same chance at a new life, just like he was given one year ago. Mission Royal Golf Club, in Casa Grande, registration and breakfast begin at 6:00 am on March 14th!Come and enjoy a great day of golf at the Mission Royal Golf Club. There will be many opportunities to win fantastic raffle prizes, silent auction items, and of course the golf awards. All Net proceeds go to benefit the valuable programs provided by the Grand Canyon Council and the Boy Scouts of America. 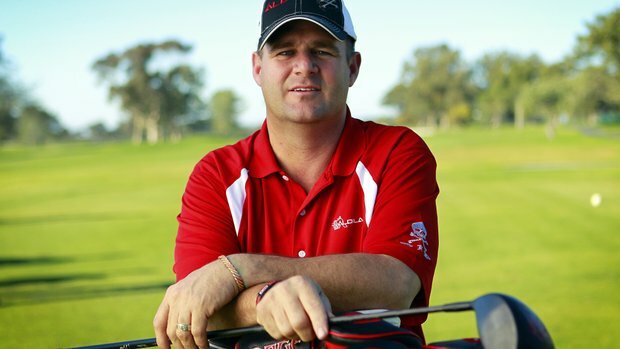 Join us February 27, 2015 for The Wounded Marine Fund's Golf Classic hosted by Sycuan Casino. 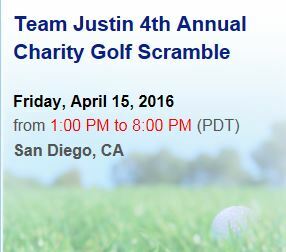 The event will take place at Sycuan Golf Resort in El Cajon, CA. The tournament consists of a four-man scramble format and 18 holes of golf. The event includes a golf cart, range balls, gift bag, on course food, team photos, live and silent auctions, and Awards Dinner. Multiple vendors will be on the course with contests and giveaways including a car for a hole-in-one. 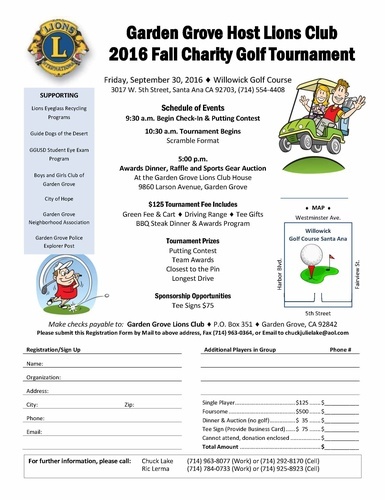 Come join us for a wonderful day on the greens at the beautiful Eagle Glen Golf Course in Corona, California supporting both the Southern California Chemical Coaters Association and the Toys for Tots. Help us reach our goal of 400 toys donated and put a smile on a child this holiday season! 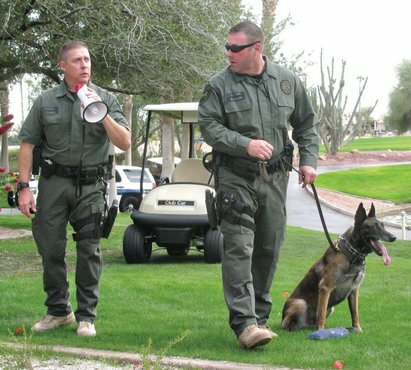 Pebble Creek will be hosting the sixth annual charity golf tournament in support of the City of Goodyear’s Police Department K9 Unit. The Pet Companion’s Club is sponsoring this tournament and invites you to take part in this worthwhile event taking place on Saturday, November 15, 2014. The tournament will be played on the Tuscany Falls/Palm Course at 12:30 p.m. (shotgun) and the format is four person scramble (no handicap requirement). 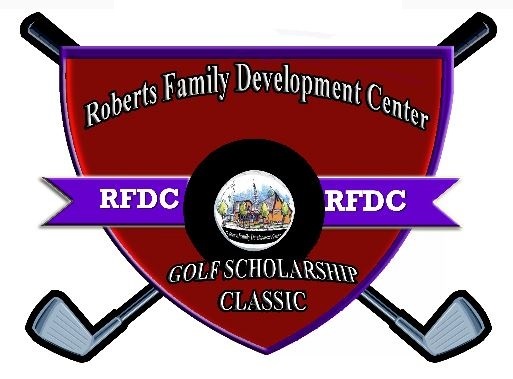 Cost of this event is $85 per player which includes golf and a dinner immediately following the tournament ($50 per player for homeowners with a PebbleCreek Golf Players Card). If you are interested in participating in this worthwhile event, would like to make a donation, or have any questions, please send an email to k9golftournament@gmail.com or call Chrissy Bridges at 623-935-9710 or Jeanne Place at 623-935-4413. The Canyon Lake Golf Course announced plans this week for the 2nd annual Veterans Day Golf Tournament to raise funds to assist service members who have been injured in the line of duty. 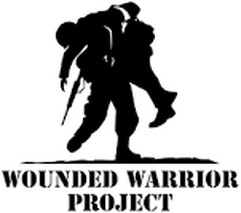 All funds raised from the tournament will be donated to the nonprofit organization, Wounded Warrior Project (WWP), and will support a full range of programs and services for this generation of injured veterans and their families. 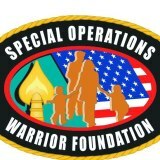 Last years event raised close to $3,000 for the Wounded Warrior Project. On Saturday, November 1, 2014, Valley View Elementary Foundation is hosting their annual Golf Tournament Fundraiser. The Foundation's goal is to nurture a sense of community for Valley View parents while raising some funds for our children. Come and have fun while supporting the Valley View Foundation. Light breakfast, lunch, and a goody bag will be provided to all golfers. Enjoy some fun in the sun on the links! Join the Brea Chamber for the Mayor’s Cup Annual Golf Classic on Friday, September 19th. The event offers your organization the opportunity to cater to clients with a day out on the greens; allows your staff the chance to relax and unwind; and provides ample time for networking with a diverse array of power players in the area. Designed by Cal Olson and PGA Tour Legend Payne Stewart, Coyote Hills is an award-winning 18-hole, par 70 golf course that features five distinct tees and panoramic views. Contests: 4 Hole-In-Ones, Longest Drive, Closest to the Hole, Jackpot Putting & more ! Luau/Beach Golf Attire is encouraged! Please do not think that just because we are raising money for a good cause, this in anyway impacts the character of the tournament. The same skill level of play and rate of beer consumption is expected as past year’s event with the added benefit of raising money for the Arizona Chapter of the National Multiple Sclerosis Society for the sixth year. Last year, with your help, we raised over $15,000, bringing our total raised in five years to close to $60,000. Please come out and help us blow that total out of the water this year. To help and support cancer patients and their families deal with the physical, spiritual and emotional challenges of the disease through prayer and financials assistance. The foundation was started in 2007 in honor of Bill Young who lost his courageous battle against brain cancer in April of 2007. Bill was a Bayer Crop Science retiree and a forever Cross Lanes, WV resident. He was a loving husband, father, son, and friend and will be forever missed. Come and enjoy a great day of golf at The Southern Dunes Golf Course. silent auction items, and of course the golf awards. by the Grand Canyon Council and the Boy Scouts of America. Awards Reception and Raffle. Register a foursome and save! 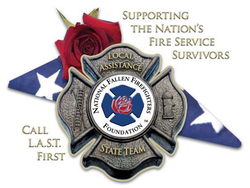 Act as the initial contact and agents for the National Fallen Firefighters Foundation. to Leadership Orientation Camp this summer. rated golf courses – The Maderas Golf Club. responders with specially designed animal resuscitation kits and training. "Win The Battle!" Foundation is a non-profit, 501(c)(3), organization that offers support and resources to those children and adolescents who have fought or are fighting cancer or other debilitating diseases. 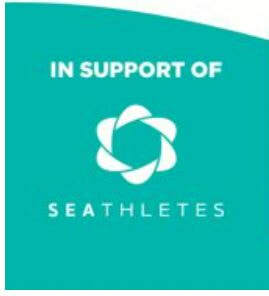 The foundation is aimed at targeting those kids who are or were also athletes while fighting their "battles". While the phrase "Win The Battle" originated from baseball and coaching my own son, we offer support to athletes of any sport. Shot Gun Tee time: 1 PM sharp! Golf Shirt, 2 Raffle Tickets, Banquet Dinner & Golfers Gift Bag! at Salt Creek Golf Club in Chula Vista. 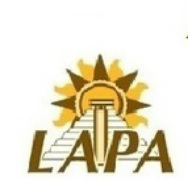 more information, please contact Frank Peralta, Jr. at frank.peralta@lapa.com. will be a myriad of prizes awarded throughout the event. Karl Malone Toyota and we wish to thank them for their support. Register your four man team for the tournament today! Prizes Include: 1st, 2nd, 3rd, Last Place. recovery and rehabilitation from motor sports racing incidents. Stepping Stones of Hope at beautiful Tatum Ranch Golf Club! Scramble format again this year! adults learn to navigate their own grief journey so that they can build family cohesion and healing. jurisdictions in urban and wilderness search and rescue activities. Sign in and Open Range at 12pm. Half Moon Sports Grill at 2121 E. Highland Ave, Phoenix, AZ 85016. The Links & Laces Golf Tour will be at the Fantasy Springs Resort Casino on June 1 weekend. This event will be hosted by Celebrity Apprentice Star Brande Roderick & friends. Price includes a room for 2 nights, VIP Players Party, Golf, Awards Party and Pool Party. 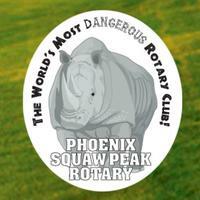 The Phoenix Squaw Peak Rotary Club needs your help. to benefit local Phoenix charities. 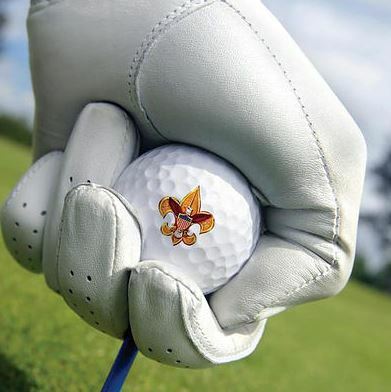 The tournament this year will be held on April 20, 2013 at Stonecreek Golf Course. raffle which are held after the golf tournament. Your donations may be tax deductible to the extent provided by law. The second annual Aces for Aplastic Anemia Charity Golf Tournament is being held on Saturday, March 9 at 10:00 am at the beautiful Borrego Springs Resort in Borrego Springs, California. The tournament is being organized by John Hickman in memory of his sister Jaymee Hickman who passed away from aplastic anemia. The entry fee is only $85 per person (golfing members pay $65), and the format will be a two man scramble. You can sign up as a foursome, but you will be playing in teams of two. All players will automatically be entered into the "Aces for Aplastic Anemia hole-in-one challenge." Every Par 3 will have a hole-in-one challenge with a prize worth $10,000-$25,000! Prizes that you will have a chance to win include a Pebble Beach golf getaway, a $15,0000 gas card, a trip for two to the Masters, and a brand new car! Special room rates will be available to players who would like to come down and stay the night before the tournament. There will also be a practice round rate of $25 per player the day before the event. In addition, there will be prizes, a raffle, and goody bags for participants. After the tournament, there will be a complimentary lunch banquet where winners will be announced and prizes will be raffled off. Over $4,000 in prizes will be raffled off! Space is limited, so be sure to sign up now! To reserve your sport or if you have any questions, call the Director of Golf John Hickman at the Borrego Springs golf shop at (760) 767-3330. Salt Creek Golf Club 525 Hunte Parkway Chula Vista 91914 Shotgun at 12:30 P.M.
All funds will be awarded to The Logan Veterans War Memoral Project. The Veterans Memorial will be placed where everyone, regardless of opinion can come together to remember and honor thier local hereos. We would like to helpmake this project a reality. The Legends Grill Golf Tournament features tee prizes, contests, a terrific raffle and a post-play barbeque with live music. Raffle and contest winners can win fabulous prizes, including local golfing packages and even a stay in Graeagle,CA courtesy of Plumas Pines Vacation Rentals. The tournament is a four-person scramble, with a $100 entry fee per golfer. Local businesses can sponsor a hole for only $50. 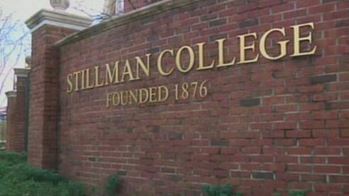 The deadline for entry is June 26, 2012. Each dollar raised at the tournament gives a Northern Nevadan the opportunity to live a healthier and happier life through CARE Chest's free programs. To enter, to sponsor a hole or for more information, stop by Legends Grill, located at 6015 South Virginia St. or call 775-853-5550. For more information about CARE Chest and its programs, please call 775-829-2273 or visit www.carechest.org. We invite you to join us on June 25th for our 9th annual CITGO/ West Covina golf classic. 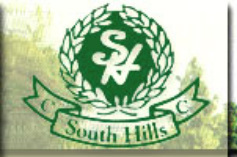 The charity golf classic begins with 18 holes at the beautiful and exclusive South Hills Country Club. Additional tournament activities include Hosted lunch and dinner, opportunity ...drawings, golf ball drop,MDA family meet and greet, silent and live auction and special evening host, UCLA announcer Chris Roberts. MDA is the non-profit health agency dedicated to curing Muscular Dystrophy, Als and related diseases by funding worldwide research.The Association also provides comprehensive health care and support services, avocacy and education. In addition to funding some 300 research projects worldwide, Mda maintains a national network of 200 medical clinics;facilitates hundreds of support groups for families affected by neuromuscular diseases;and provides local summercamp opportunities for thousands of youngsters fighting progressive muscle disease. Through your paricipation in this event , you are directly MAKING A DIFFERENCE in the lives of those serves by the association. On behalf of the Golf Classic Committee, our sponsors and MDA we appreciate your participation. 7:50 a.m. - Golfers "Cart Up"
Luncheon, Awards Program & Price Drawing Following Golf. Ryan Sagstad, uncle to Logen Roesch, SDS patient in Arizona, is hosting a Golf Tournament Fundraiser at Grayhawk Golf Club in Scottsdale, AZ. June 16, 2012. The tournament will have a shotgun start at 8:00am on the Raptor course and the cost to participate is $100 (buffet lunch, drink ticket, and prizes included). The Endless Summer Invitational is a unique cancer fundraiser that will showcase the world’s longest golfers. 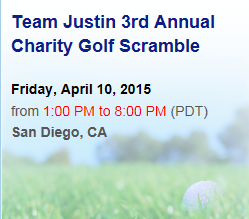 In association with Golfers Against Cancer (GAC), this is the first event of its kind in Southern California. This special two-day event includes a Long Drive Event, Dinner Gala and Pro-Am Tournament. 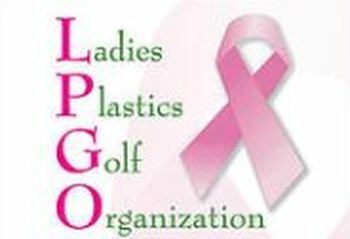 In June 2012, 72 long drive professionals will gather in Southern California to raise money for cancer research and compete for a purse of $50,000. Amateur participants will get front row seats to the power of long drive previously seen only on the ESPN world finals. Plus, they will enjoy mingling with long drive professionals at the Dinner Gala and be team paired with a long drive professional at Monday’s Pro-Am. Through the power of long drive and in partnership with Golfers Against Cancer (GAC), The Endless Summer Invitational is committed to raising funds for local life-saving cancer research projects that would otherwise go unfunded. GAC is a national organization founded in 1997 by a group of golfers who had lost two of their golfing buddies to cancer. Motivated to raise money to fund cancer research, they created an annual golf tournament with live and silent auctions. 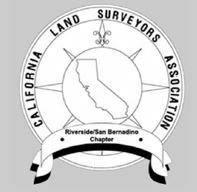 In 2011, the Southern California GAC chapter was formed. The mission of this chapter is to establish a funding stream that directly benefits local cancer research. To date, GAC has raised over $20 million for cancer research. 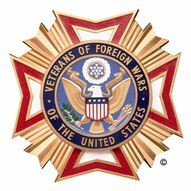 U.S. War Veteran’s PTSD Foundation is an IRS designated 501(C) (3) non-profit corporation, all donations are tax deductible. May 21at Cottonwood Golf Course, 3121 Willow Glen Road, El Cajon. The tournament benefits wounded Army, Navy and Marine Corps personnel. 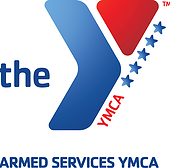 The Armed Services YMCA is the host sponsor. Cottonwood Golf Club is donating the course, personnel and equipment for the event. 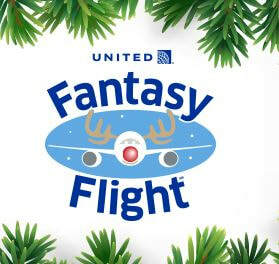 The tickets are $99 and include breakfast, cart and lunch. Email Joe Browning at JoeRBrowning@hotmail.com for more information. Welcome to DFS Charities' website for the "Making Change" Golf Tournament benefiting Autism Speaks. All proceeds from this event will be donated to the Autism Speaks organization. The Annual ArizonaMagic.org Charity Golf Event is a fun way to benefit children and families in need throughout Arizona. The proceeds benefit the “Giving Kids a Shot” campaign which creates a positive environment to enrich the lives of Arizona youths. The mission of Arizona Outdoor Adventures (AOA) is to affirm, enrich, and positively impact the lives of at-risk children through the peace and quiet of nature, the wonders of God’s creation and healthy outdoor activities, including fishing, hiking, jeep rides, horseback riding, etc. AOA partners with established inner city youth organizations to annually provide a series of tent camps from May-October in Arizona’s White Mountains. All expenses paid by contributions to the outreach. In 2011 AOA experienced the distruction of almost all equipment in the wallow fire as pictures show. It therefore becomes much more important for your help and participation in this event. Thank you for all off your help and prayers. While kids all over the Valley of the Sun are starting to make their camp plans for the summer, there’s another group of kids who can’t make the same kind of plans so easily. These kids can only imagine the hikes, horseback riding, jumping in the pool and late night stories around the campfire. These kids have chronic and serious illnesses that prevent them from enjoying these traditional activities. These are the kids of the Camp Soaring Eagle Foundation. Camp Soaring Eagle’s mission is to give kids with serious illnesses and their families a chance to discover the healing power of laughter and the sheer joy of play, that sickness has too long denied them. Camp Soaring Eagle Foundation is proud to partner with Legend Trail Golf Course in Scottsdale, AZ, to hold “Tee It Up For Children’s Laughter” golf tournament on Saturday, April 28, 2012 proudly sponsored by American Kiosk Management and Longboard Asset Management, LLC. 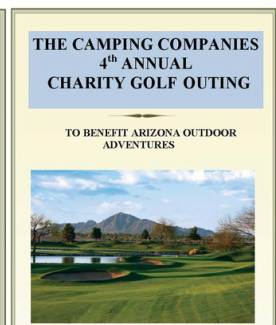 Camp Soaring Eagle Foundation’s generous supporters and participating golfers will help give children from Arizona, ages 7 – 17, with serious illnesses, the opportunity to attend overnight camp. Camp Soaring Eagle provides these year round, medically safe camping programs completely free of charge to the campers and their families. 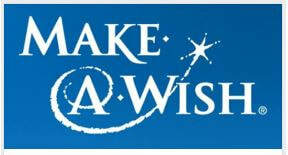 Funds raised through through this ONE Concept event will help to make one child's wish come true. medical conditions to enrich the human experience with hope, strength and joy. social networking, and youth development. -Teeing ground of #10 Torrey Pines North Course. -First drive struck at 3:00pm. -White/Forward tee box used, #10 green should not be in prominent landing area. -Entire hole to be roped for safety and spectator purposes. -Security staff will be hired to stay on site through the 12 hour attempt. -Light towers will surround tee box and target areas. -Minimum of two PGA members will be on site for the duration of the attempt, as well as two official time keepers. -Hitting zone will be marked by bright ropes laid across the ground (no paint or permanent markings on the course necessary).